Your savings keep adding up. Up to 5% savings* on online shopping, groceries, SMRT rides* and more with Citibank SMRT Card. Your savings keep adding up with the Citibank SMRT Card. Enjoy up to 5% savings* on your daily spend all year round. Plus, redeem your SMRT$ for cash rebate or vouchers. Already a Citi Credit Card Cardmember? Refer a friend and be rewarded with S$50 Cash Back! transactions of $50 and above. 3% SMRT$ is awarded for transactions less than $50. Please note that any online transactions made on these merchants’ websites will be regarded as online shopping for which your savings will be up to 3% only. Get up to 3% savings2 on all your online shopping! 2Excludes all travel-related merchant worldwide whose main business activity are classified as: Airlines, Air Carriers (Merchant Category (MC) Code: 3000 to 3350 & 4511), Car Rental Agencies (MC Code: 3351 to 3500 & 7512), Lodging - Hotels, Motels, Resorts (MC Code: 3501 to 3999 & 7011), Travel Agencies and Tour Operators (MC Code: 4722), Passenger Railways, Taxicabs & Limousines, Bus Lines, Steamship & Cruise Lines, and Other Transportation Services (MC Code: 4112, 4121, 4131, 4411, 4789), Direct Marketing - Travel-Related Arrangement Services (MC Code: 5962). The main business activity of a merchant is determined by the business classification of that merchant's outlet. The main business activity of a merchant is not determined by Citibank Singapore Limited. For monthly statement retail purchases of less than $300, SMRT$ earn rate will be 2.7%. 3For monthly statement retail purchases of less than $300, SMRT$ earn rate will be 4.7%. 4For monthly statement retail purchases of less than $300, SMRT$ earn rate will be 4.7%. Get up to 2% savings5 on your EZ-Reload auto top-up transactions. Plus, no convenience fee charges. SMRT$ earn rate will be 0.3% less. Get up to 1% savings6 on selected bills with Citibank One Bill. For more details, visit www.citibank.com.sg/onebill. ^^ Please refer to Cardmember Agreement for detailed definition as well as exclusion(s) applicable. • Your spending habits may be different from this example. • Assuming total spend in statement month is at least $300. • Assuming minimum spend per transaction at participating Groceries merchant(s) and EZ-Reload Auto Top-up is at least $50. • Please note that any online transactions made on these merchants’ websites will be regarded as online shopping for which your savings will be up to 3% only. Redeem SMRT$ for shopping vouchers via Online. 3. Redeem SMRT$ for vouchers. Redeem SMRT$ for cash rebate instantly via SMS. Only available for Main Citibank SMRT Cardmembers. Main Citibank SMRT Cardmembers must have sufficient SMRT$ for redemption. Approximately 7 working days should be allowed for processing. Cash rebate will be reflected as a credit in the statement of account and is not to be taken as a payment in reduction of the minimum payment due, total amount due, or any amount in between that is due on the Main Citibank SMRT Cardmember’s Card account statement. Multiple functionalities for your convenience in one card. Use your credit card as an EZ-Link Card for your daily commute. Enable the convenient EZ-Reload facility to enjoy Auto Top-up when your EZ-Link value is insufficient.Plus, there is no convenience fee charge for EZ-Reload Auto Top-up transactions. Pay, wave and go for purchases under $100. Visa payWave is a contactless payment feature that lets you simply wave your card on the reader at checkout rather than handing it to the cashier. Voucher available for collection via the BOOK NOW button. Valid for the first 1,000 redemptions per calendar month. Earn up to 10% Citi Rebate on top of your existing card benefits at over 300 locations. Enjoy this month's retail therapy specials, with your Citibank SMRT Card. For foreigners, minimum annual income to qualify is $42,000. What kind of savings does the Citibank SMRT Card offer? 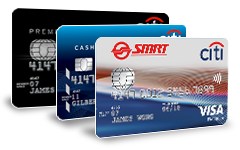 Savings for Citibank SMRT Card comes in the form of SMRT$. SMRT$ can be accumulated to redeem for cash rebate or vouchers. How can SMRT$ be redeemed? Please login to Citibank Online and select Rewards & Offers to redeem your SMRT$. Alternatively, please call our 24-Hour CitiPhone Banking at 6225 5225. What can be redeemed with SMRT$? Customers can redeem SMRT$ for cash rebate and vouchers (including Giant, Cold Storage, Sheng Siong and more). For full list of vouchers, please login to Citibank Online and select "Rewards & Offers". 1 SMRT$ is worth $1. Although SMRT$ cannot be earned at the following merchants, can SMRT$ still be used to redeem vouchers at these merchants (Cold Storage, Crystal Jade Group of Restaurants, Swensen's, Sakae Sushi and Jack's Place Steak House & Restaurants)? SMRT$ can still be redeemed for vouchers from these merchants: Cold Storage, Crystal Jade Group of Restaurants, Swensen's, Sakae Sushi and Jack's Place Steak House & Restaurants. Where else can my Citibank SMRT Card be used? Apart from merchants that accept Visa payments, your Citibank SMRT Card also doubles up as an EZ-Link Card. Hence, it can be used for public transport fare payments and at merchants where EZ-Link payments are accepted. How does the EZ-Reload Facility work? Whenever the remaining stored value of the ez-link Facility on your Citibank SMRT Card is insufficient for your transaction, a default value of $30 (″EZ-Reload amount″) will be automatically debited from your new Citibank SMRT Card account. This EZ-Reload amount will be charged directly to your Citibank SMRT Card, earning you up to 2% savings each time. Please note that there is no convenience fee with each EZ-Reload transaction. How do I activate the EZ-Reload Facility on my new Citibank SMRT Card? You will receive a notification containing a collection slip number (activation code). Please present your Citibank SMRT Card and collection slip number (activation code) TransitLink Ticket Office or General Ticketing Machine installed with an external card reader to activate the EZ-Reload Facility on your Citibank SMRT Card. Upon activation of the EZ-Reload Facility, a default value of $30 will be automatically debited from your Citibank SMRT Card account and credited to the ez-link Facility incorporated with the Citibank SMRT Card. You may check the application status of your EZ-Reload Facility on www.ezlink.com.sg. How do I change the EZ-Reload amount on my Citibank SMRT Card? If you wish to change the default $30 EZ-Reload amount, please refer to the steps below. Please allow up to 4 weeks for the change to be made. Proceed to any TransitLink Ticket Office to terminate the default $30 EZ-Reload Facility. Please call EZ-Link at 6496 8300 to terminate the default $30 EZ-Reload amount. Step 2. Please allow at least 7 working days for your account to be updated before reapplying for the EZ-Reload Facility with a new EZ-Reload amount. You may do so by logging on to www.ezlink.com.sg. Step 3. You will receive a new collection slip number (activation code) within 14 days. Can I use the Citibank SMRT Card for purchases at non-travel related merchants that accept ez-link payments? Yes, you can. 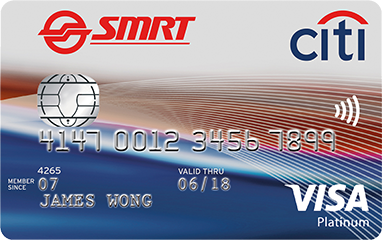 Your new Citibank SMRT Card can be used for travel on public transport as well as for payment at non-travel related merchants. I have activated the EZ-Reload Facility before on my previous Citibank SMRT Card. Why do I have to activate the Facility again? Each Citibank SMRT Card has a unique ez-link identifier. As such, the ez-link Facility and the EZ-Reload Facility activated on your previous Citibank SMRT Card is different from the one on your new Card and cannot be transferred. What do I do with the remaining ez-link value on my previous Citibank SMRT Card? If you possess the physical Citibank SMRT Card Please bring your Citibank SMRT Card to the TransitLink Ticket Office to have the facility deactivated and the balance refunded to you. The staff will destroy the Citibank SMRT Card immediately. If you do not possess the physical Citibank SMRT Card Please contact our 24-Hour CitiPhone Banking. If you possess the physical Citibank SMRT Card Please bring your Citibank SMRT Card to the TransitLink Ticket Office to have the balance refunded to you. If you do not possess the physical Citibank SMRT Card You will not be able to obtain the refund of the remaining balance in your previous Citibank SMRT Card. What happens to my GIRO, installment payment plans and/or recurring payments arrangements on my previous Citibank SMRT Card? If this new Card is a renewal card or a replacement for a damaged Card, the credit card number is the same. As such, your existing arrangements will remain unchanged. * For new Citibank SMRT Card holders, your EZ-Reload amount is defaulted at $30. ** For renewals and replacement cards, the EZ-Reload amount on your Card will be the EZ-Reload amount on your previous Citibank SMRT Card. * For monthly statement retail purchases of less than $300, SMRT$ earn rate will be 0.3% less. # 4.7% SMRT$ is awarded for transactions of $50 and above. 2.7% SMRT$ is awarded for transactions less than $50. + 1.7% SMRT$ is awarded for EZ-Reload transactions of more than $30. 0.7% SMRT$ is awarded for EZ-Reload transactions of $30 or less.